1928. Buster Keaton, star of the silent screen, arrives in Culver City, at the movie studio which is to be his new home. He takes this moment to reflect on his life and career. 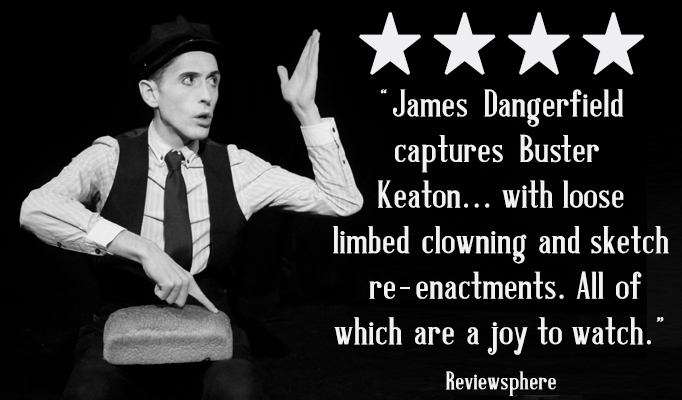 Through slapstick, songs and soft shoe shuffle, follow the triumphs and trials of silent film star Buster Keaton as he makes his iconic movies. As the world whirls around him, with his marriage failing, his best friend on trial, his career in danger and turning to the bottle, Buster must hit his mark as he films the most dangerous stunt of all. 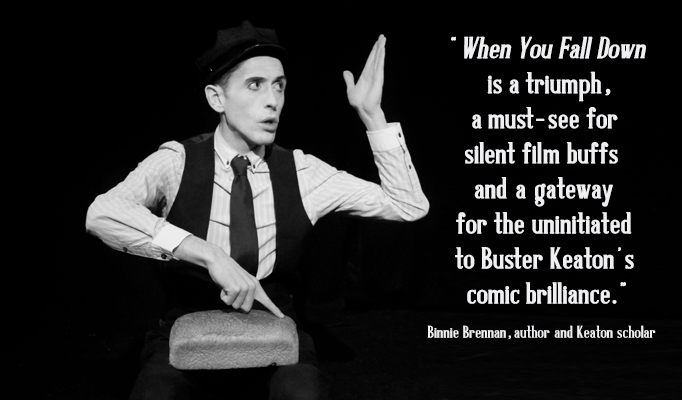 With re-creations of Buster’s tricks, mime and magic, this award-winning show is a tribute to “The Great Stone Face”; a man who always got back on his feet, no matter how many times he fell down. 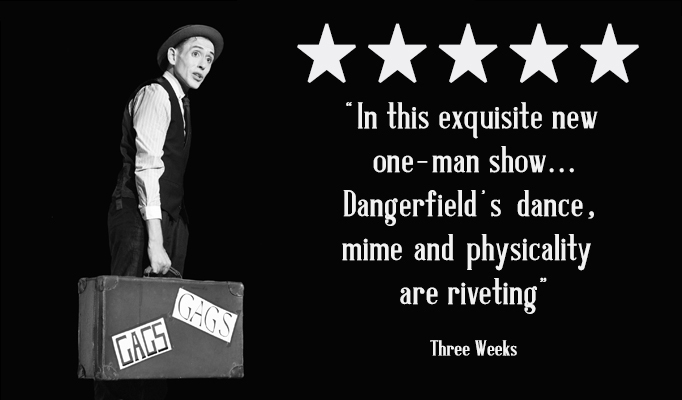 When You Fall Down previewed in London in fall 2017, before travelling to the US where it was seen by Buster’s own family. It has appeared at theatres around the UK, including sell-out London shows and a West End appearance at The Other Palace. It has been performed at The Slapstick Festival, Bristol and in Paris, France. In August 2018 When You Fall Down had a month-long run at The Pleasance Edinburgh, with many sell-out performances, several 5 and 4 star reviews and an invitation to appear on Pick of The Fringe. 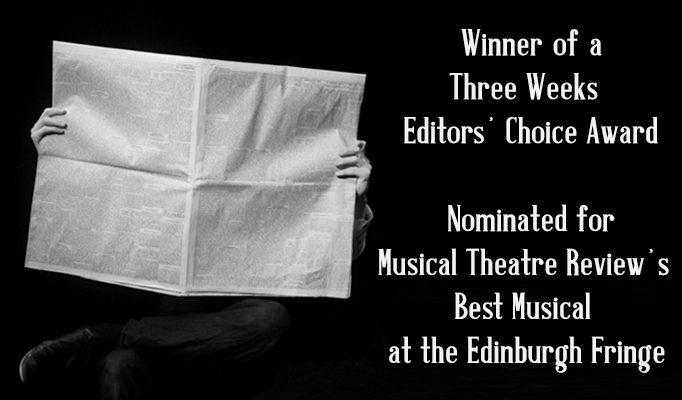 In Edinburgh the show won a prestigious ThreeWeeks’ Editors Choice Award and was nominated for Musical Theatre Review’s Best Musical. 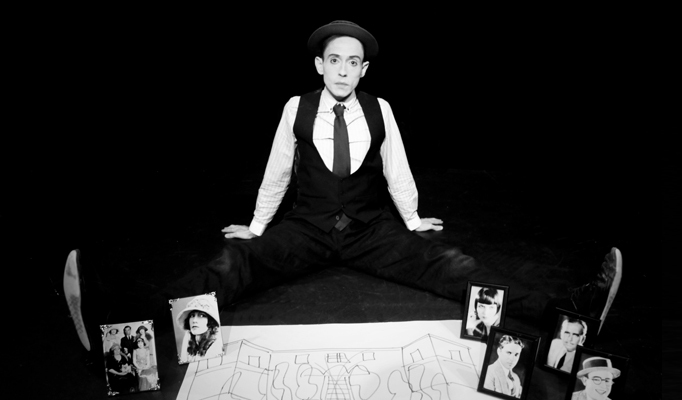 The show is endorsed by The International Buster Keaton Society. 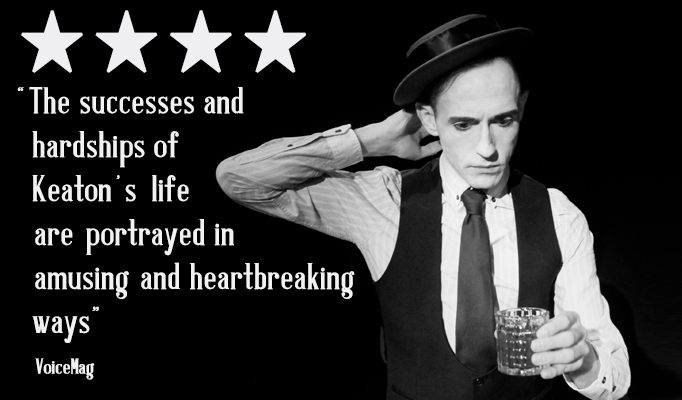 Click here to read the ThreeWeeks Review of When You Fall Down at Pleasance Edinburgh. 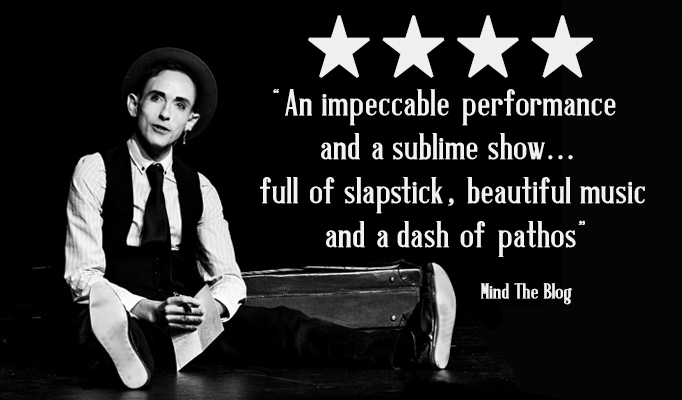 Click here to read the Mind The Blog Review of When You Fall Down at Pleasance Edinburgh. Click here to read the LondonTheatre1 Review of When You Fall Down at The Other Palace (West End). JUL 5-7: Théâtre de Ménlimontant, Paris, France. JUL 14: The Pleasance, London, UK. JUL 18: The Other Palace, London (West End), UK. AUG 1-27: The Pleasance Courtyard, Edinburgh, UK. SEP 22: St Peter’s Arts Centre, Preston, UK. SEP 29: Mill Studio, Yvonne Arnaud Theatre, Guildford, UK. NOV 18-19: The Tabard Theatre, London UK. September 1921. A girl has been found dead at Roscoe’s Labor Day party, and the papers are determined to demonize him, in order to make an example of prohibition-flouting movie stars. As Buster reflects on his friend’s predicament, an idea strikes for his next short film…. Hi James, I’ve litterally only just found out about this show and I’m gutted I couldn’t see it. Are you doing anymore shows in the London area anytime soon? Buster took my grandma Esther dancing at the Actor’s Colony in Muskegon when she worked at Pascos. I wrote a song about the story. Love to see you come to Muskegon and take the tour. Hi James. Looking forward to seeing your show tonight at The Other Place. I grew up watching Buster, Harold Lloyd, Laurel and Hardy and Chaplin. My grandad and I would snuggle up on the sofa and watch them back to back for hours. Hi Elfie! That’s lovely to hear. Hope tonight brings back many wonderful memories! Enjoy the show and feel free to say hi after! Saw the show at Edinburgh today. Absolutely loved every minute. The acting was perfect. The songs were tuneful, poignant (especially the House I built for Natalie), original and expertly sung. The staging and props were spot on, especially the newspaper! The moving film pictures blended extremely well. I love the fringe and come every year, the show is one of the most enjoyable ever. I have no connection to the show at all, so i can recommend it without any bias. I hope to catch it again one day. Hi James will you be doing more London shows in the future? Hi Shil! I’m performing the show next on Sat 29th September in Guildford at The Yvonne Arnaud’s Mill Studio theatre. 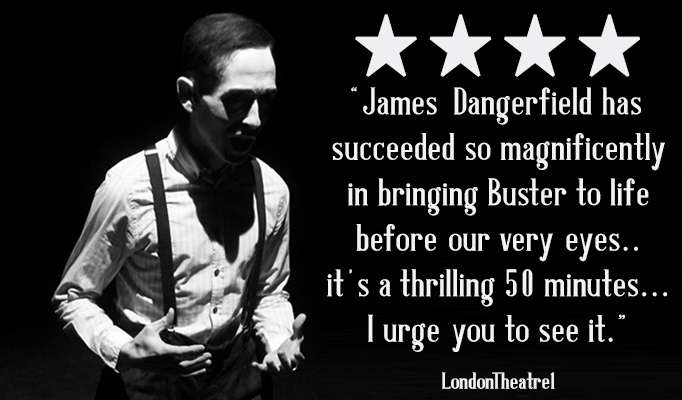 But keep an eye out on my website or on twitter @BusterMusical for announcements about future dates! Merry Christmas, James. Will you be doing any new shows in 2019 in the London area?